Search Engine Marketing or SEM is an umbrella term used to refer to all activities that can improve your web presence. Search Engine Optimization is one part of Search Engine Marketing or Digital Marketing while the other part includes Social Media Marketing and Pay-Per Click Campaigns. All these activities have a single aim which is boosting the number of visitors to your website. As you can learn from the Search Engine Optimization page, the outcome of the teams’ efforts depend on the design of the website, the quality of content and the smart ways in which the back-links are built for the site. 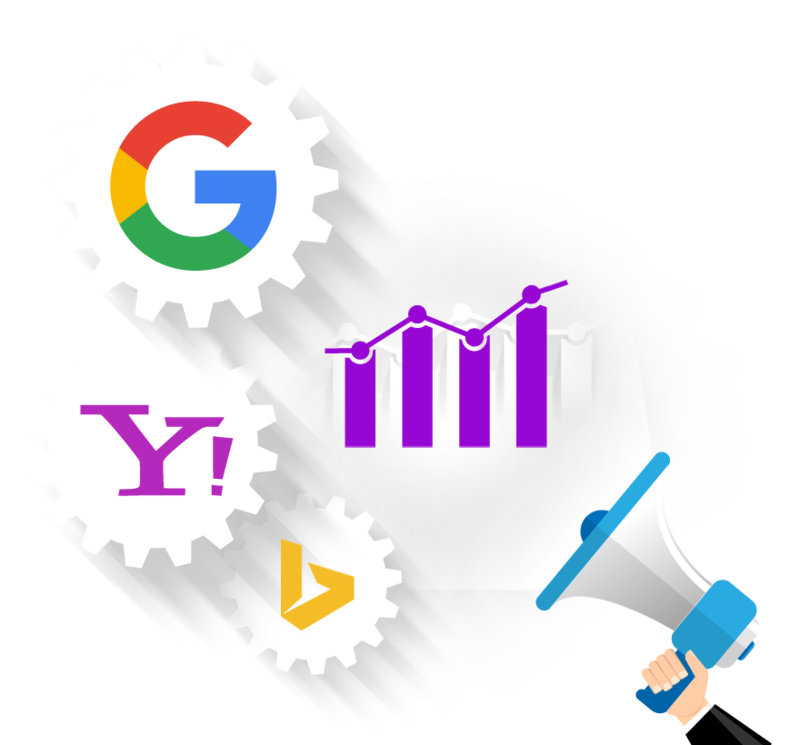 Running PPC campaigns and Social Media Marketing includes some aspects of the SEO along with an underlying responsibility of making an intelligent investment to marketing your practice. Smart SEO and brilliant investment to marketing your practice can give you outstanding results in the form of leads. How paid marketing can help my business? Search Engine Marketing includes both organic marketing (SEO) and paid marketing of various types such as display ADS, Mobile ADS and Map ADS. If you have already checked out our Search Engine Optimization page, you probably might be wondering as to why paid marketing is required when there is SEO. Well, the answer is remains the same as the ultimate goal of digital marketing, which is DRIVE MORE TRAFFIC to your website. One addition here is that the leads in the case of paid marketing can be of higher quality. Everything, from the tone of the content to the design, in a Search Engine AD or Social Media AD is custom-made in way where your potential patient is quicker in making the decision about his/her visit to your office. Google Adwords - For Google AdWords, ad visibility works like an auction. Whether your ad shows up in Google’s search results depends on which keywords you target and how much money you bid on them. These keywords are specific word stream and phrases included in queries searched by Google users. You bid on the queries in the hopes that your ads will be displayed in the organic search listings. Your maximum bid and the quality of your ad determine whether your ad will be displayed. Each time someone clicks on your ad, you pay a fee, hence the name – “pay-per-click” (PPC) advertising. You can set-up a daily budget, adjust your targeted keywords, and deactivate a campaign with the click of a button. When evaluating your daily budget, the most important number isn’t just how much you spend. It’s the cost per new patient conversion. PPC Campaigns - Pay-Per Click campaigns are those ad campaigns which appear on the search engine when your potential patient searches a key phrase. The patient sees a landing page once he/she clicks on your advertisement. The landing page will be designed in a way where your potential patient can quickly send an enquiry to you. Display Ads - These are ads of your business that are displayed on relevant pages of other websites. Your display ads may be published in a dental health web portal or general health web portal. A click on the advert by your potential patient leads him/her to your website. Mobile Ads - These are ads that are custom-made to suit smart phone platform. While experiencing a user friendly platform. Social Media Ads - Under social media ads there are several categories. These ads are displayed in social networking sites and media sites where anyone and everyone can share content.